Welcome to your complete guide to graduations at Fort Leonard Wood. This is an exciting time in the life of your soldier and we endeavor to provide you with the most comprehensive graduation information available for Fort Leonard Wood. Graduation schedules and events are published below to aid you in scheduling your attendance at your soldier's graduation. 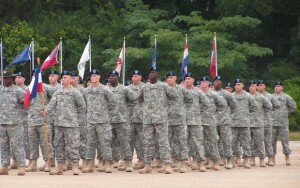 You will find many cost effective options for traveling to Fort Leonard Wood. You will be able to review the complete details on the many hotels available to meet your lodging needs. The greater Fort Leonard Wood area provides many options for dining ranging from fast food to full service restaurants. Be sure to check out the information on the many attractions available for sight seeing. Where is Fort Leonard Wood? Fort Leonard Wood is located in the heart of the Missouri Ozarks about 90 miles east of Springfield, Missouri and 140 miles west of St. Louis on Interstate 44. The military installation is also just 120 miles from Branson. Click here for more information on air, bus, and train transportation for Fort Leonard Wood. Due to security measures that are implemented at Fort Leonard Wood you may experience delays getting onto the post. Be sure to allow for extra time to make sure you arrive at the graduation event on time. Important Note: Visitors 18 years and older, entering Fort Leonard WOod, who do not have a DoD identification card, will be subject to a background check before being allowed entry to the installation. More information on gaining access to the installation may be found on the installation's website. What to wear to a graduation ceremony? Your soldier will be dressed in a Class "A" uniform which is the Army's formal uniform. You may wear want you want from casual to your Sunday's best. Pass Policies vary by unit and depending upon the next destination of your soldier. Please see unit for details on passes after graduation. There are no animals allowed at the Graduation. The only exception is for service animals. Cell phones are not allowed in use while driving unless you have a hands free connection. The fine for using cell phones without hands free is $50.00 and $25.00 processing fee. Seat belts are required and strictly enforced. Please click here for the complete graduation schedule of Fort Leonard Wood.